I didn't pay much attention to the weather forecast when I decided to take a day off work last Friday. My daughter and I thought we'd do some window shopping in Big Bear Lake, about 100 miles east of Downey. Our first surprise was the sign stating that chains were required. We bought a set of chains at the last chance convenience store, then started up the mountain in the rain. An hour later, we arrived in Big Bear Village, where we dutifully braved the snow and wind to window shop. For about 20 minutes. Then we found a great little cafe called The Troll and had lunch while we watched the snow fall. 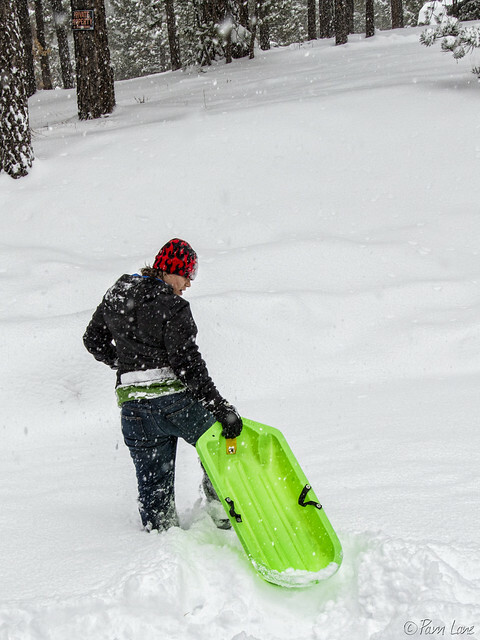 And finally, we found a snowy hillside where we could try a little sledding. Not what I expected. But a good time was had by all.